Hopefully by now you’ve grabbed your copy of the boxed set, A Christmas to Remember, and are completely in the holiday spirit thanks to the novellas. I thought I’d share a bit more about my story, Restoring Christmas, and the place that brings Holly Christmas back to Geneseo Valley: The Christmas Mansion. I tossed the idea around of having a literal Christmas character name for awhile, nervous it would be too cheesy. After my visit to Castle Noel in Medina, Ohio, I realized I could pull it off if everything in the character’s life revolved around Christmas. The holiday. Her family name. The family business. As I mentioned in an earlier post, the story started during my Castle Noel tour. It was Christmas on steroids. It was magical. Amazing. I wondered, what would happen if you had to work at a place like that and you hated the holiday? Then, I kept raising the stakes by making it the family business. A staple in the community. The beloved tourist attraction that kept her parents so busy they missed out on life. A showplace Holly Christmas left far behind as soon as she graduated high school. Although I didn’t incorporate everything I saw during my tour, Castle Noel is known for their Christmas themed movie props. Their show stopper is the actual slide from A Christmas Story. If you remember Ralphie, he froze as soon as Santa asked him what he wanted for Christmas, so he agreed to a football and down the slide the elves threw him. Ralphie remembers he really wants the Red Rider BB gun, and stops himself on the slide to confess. My son and I were able to go down that slide. The guide told us their oldest guest to enjoy the slide was ninety! We also saw props from The Grinch, starring Jim Carrey. I believe they had Cindy Lou Who’s entire bedroom. There were pieces from the Santa Clause movies, including wardrobe. There were animation displays from movies I vaguely remember as a kid. They had an entire room of signed photos from the celebrities who have starred in beloved Christmas movies through the years. Our first prop stop was outside to view the actual RV from Christmas Vacation. Cousin Eddie’s RV. That was so fun to see and hear how they purchased it and got it from California to Ohio. Besides the props and slide, there were also entire Christmas displays from previous years that used to adorn Macy’s. My goodness the creativity in those displays. They truly were breathtaking. It’s easy to get in the Christmas spirit at Castle Noel! All images pixabay and are not actually at Castle Noel. What you see in Restoring Christmas that is a tip of the hat to Castle Noel is the room where Holly hangs ornaments from the ceiling. The room in Castle Noel has over 10,000 ornaments from the ceiling. As you move forward in the tour, to get to the next exhibit, you have to squeeze through “Santa’s Chimney,” what I can only describe as thick, thick gym mats that are tricky to maneuver. Kids were delighted to make it through. I was praying I didn’t get stuck! If you are ever in NE Ohio, Castle Noel is open all year. I know the ticket price at first glance seems pricey, but if you love Christmas, movies, trivia, and history about Christmas movies, etc…it is worth it. Beyond worth it. Have you visited a place that was completely dedicated to Christmas? Leave a comment sharing your experience and I will choose TWO winners to receive A Christmas to Remember. Merry Christmas! 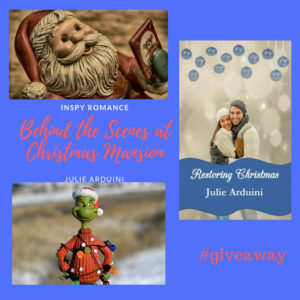 Julie Arduini loves to encourage readers to surrender the good, the bad, and ---maybe one day---the chocolate. She’s the author of ENTRUSTED: Surrendering the Present, as well as ENTANGLED: Surrendering the Past. The last book in the series, ENGAGED: Surrendering the Future, is coming soon. She also shares her story in the infertility devotional, A WALK IN THE VALLEY. She also blogs every other Wednesday for Christians Read. She resides in Ohio with her husband, two children, and chocolate stash. Learn more by visiting her at http://juliearduini.com. Hi Julie, Castle Noel sounds…overwhelming! I have never been to a place that is completely dedicated to Christmas. To be honest, it doesn’t really sound like my thing. I love Christmas- just the idea of Christmas stuff all year takes away from what Christmas is for me. Thanks for sharing about your visit and story. Hi, Wemble! I’m glad that Castle Noel offers it as a tour or I would have been overwhelmed. I agree, I can’t visit Christmas places until at least October, November is even better. Thanks for reading! Hi! I really enjoyed your post! I want to know why all that “stuff” isn’t in CA where I live!! !When I was little we used to visit Santa’s Village in Northern CA!! So fun, but it has since closed! Hi, Linda! From what I understand, they have a lot of the pieces from auctions. The stories were fascinating, especially driving the RV from Christmas Vacation! Hi Julie! I enjoyed your story Restoring Christmas in the boxed set. I even read up on Castle Noel. May need to make a trip to Ohio. In Frankenmuth, Michigan, we have Bronner’s Christmas Wonderland which is open year around. While it is primarily a retail shop selling thousands of unique Christmas ornaments, the grounds has an exact replica of the Christmas Chapel, of Oberndorf, Austria. 200 years ago the renowned German Christmas carol “Stille Nacht / Silent Night” was written and sung for the first time. I have heard of Bronner’s Christmas Wonderland. It’s definitely on my bucket list! I definitely recommend people visit Castle Noel and A Christmas Story museum (if you love the movie.) Fun places in NE Ohio! That sounds like amazing fun! Thank you for sharing! I have ACTR, so no need to enter me! Hi, Paula! 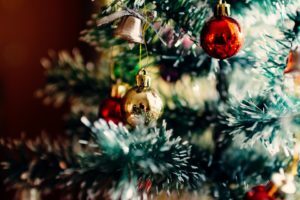 Thanks for reading, and for having A Christmas to Remember! We’re really proud of that boxed set. I’ve never been to something like that. It sounds interesting ! Hi, Diana! It really is. I just went back and it was as fun to visit the second time. Thank you so much for reading A Christmas to Remember. I loved the stories, too. They really put me in the Christmas mood. There was a store about 2 hours away from me called, “The Christmas House”. It was open year round. If you weren’t in the mood for Christmas you surely would be after you left. Unfortunately, it is gone and I’ve never found another to take it’s place. I love visiting places like The Christmas House. You’re right, it really puts you in the Christmas mood! Here in Michigan we have Bronner’s – a store known state wide for Christmas EVERYTHING all year long. My kids beg to go there every year! I have definitely heard of Bronner’s, it doesn’t disappoint from what my friends say. I think I need to check it out. Thanks for reading! I have not visited anything that was dedicated solely to Christmas, but now I am super intrigued and want to visit. Thanks for sharing about Castle Noel, it sounds like an awesome place! I think everyone should visit a Christmas-themed place at least once. I really think it brings out the inner child in all of us. I hope you have a very Merry Christmas! Thanks for keeping us in the loop on books! Yes, anyone I know who lives in Michigan mentions Bronner’s. That’s a great tradition to buy the ornaments. Thanks for reading today! That sounds like it was fun, Lisa! Castle Noel sounds pretty awesome. I would love to visit the Christmas Story house in Cleveland, OH sometime since that is one of my favorite movies so I may just have to take a road trip some day and visit both. If you love the movie, you HAVE to visit the Christmas Story House. The first time I went, the shed was full of broken leg lamps and there was a random dog barking that we thought might be related to the Bumpus dog. We learned a lot of neat trivia, and at my last time at Castle Noel, one of the elves from A Christmas Story was helping out with their place. Small world! Thank you for sharing your experience Julie. I haven’t visited anything like that. We visit neighbor church since they set it as you are walking the Bethlehem streets during the Christ birth. I love the feeling :) they even have hands on station where you can try to prepare spices, oils, and other activities common for that time. I have always wanted to experience something like that. It would feel so sacred, I’m sure. Have a very Merry Christmas!